A friend of mine called Clitheroe Paul came up for a visit and wanted to do some orchid photography, so I took him first of all to the Dockacres to check out the Marsh Orchids (both Northern and Southern and rare hybrids at this site), together with some nice Pyramidals and Common Spotted Orchids. It was more a question of just getting there on time to see the remnants of this year's Marsh Orchids with the majority already going well over. It was nice to enjoy the beautiful "magenta" marvels of the few that were still on offer. The status of the Pyramidals had changed a little and out of the three previously recorded populations, one population had disappeared completely, whilst another population which only had one flower previous had grown up to five flowers, and the last population towards the A6070 had 7 well spaced flowers whereby previously they had always been closely bunched. Couldn't find any Bee Orchids here, but there were lots of Common Twayblades and Common Spotted Orchids. A Lesser Whitethroat and Chiffchaff could be heard calling. Also had my first Ringlet and Meadow Brown Butterflies. Also Large Skippers were present. Other species noted were Ragged Robin and lots of Imperforate St John's Wort, Scarlet Pimpernel, Teasel, Forget Me Knots, Thistles and patches of Spring Cinquefoil. Self Heal adding much colour. We left there and went on to another well known orchid site in Carnforth and here we saw some of its lovely Bee Orchids and a few Common Spotted Orchids of which here you always seem to get the added bonus of the "white flowered variety as well". I checked out the main area for the Marsh Helliborines, which has expected still have drooping heads and will be another three weeks before they are at their best, but still good populations to show. Still looking out for the Blue Fleabane and the Common Broomrape, but they do seem to have dissapeared from the site. Nice to be serenaded throughout by the Lesser Whitethroat. Feeling peckish by 1300hrs we decided to have lunch at the "Waters Edge" near to the Dockacres just to fuel up a little before we drove off to the Plain Quarry Car Park to then commence our long trek up onto the Hutton Roof Complex to discover lots more wild and wonderful beauties on offer. A Report of some of Dalton Crags and Hutton Roof's - Bryophytes, Lichens, Plants and Insects etc. I mentioned only last week that I was in the good company of Mike Gosling and Jeremy Steeden from the Fylde who joined me in a short walk whilst they surveyed of some of the Mosses, Liverworts, Lichens, Sedges, Ferns, Grasses, Flowering Plants, Coleoptera, Lepidoptera and lots lots more, which they were able to find in just a seven hour period within Dalton Crags and the Hutton Roof Common. The three of us had a fabulous day, although now I wish I had taken along my "Latin Dictionary", but they have been so kind as to forward a "great list" of the varied species we saw on the day of which some are extremely rare, some rare and some more common, and each habitat had its varied contributions. They do intend to visit again in the next couple of weeks to check out the rare Epipactis Schmalhauseneii and other Epipactis specimens, and maybe they will add even more species to the list. Habitat: Limestone pavement and crags, grassland, trees and walls, and some acid (loess) pockets. Atrichum undulatum. On shaded mossy limestone under tree. Bryum sp. Green-red species with abundant red-brown tomentum. In damp hollow on clint surface. Campylopus introflexus. On old lock. Hypnum andoi. On tree trunks, very common. Hypnum cupressiforme. On trees, banks and walls. Racomitrium lanuginosum. Normally in acid habitats but here found over limestone. Preissia quadrata. In grike, hexagonal patterning and pores obvious. Radula complanata. Seen on one tree. Scapania aspera. Common Scapania on limestone areas. Lepraria incana. In usual shaded sites on trees, banks, trees. Melanelixia glabratula. On tree trunk. Normandina pulchella. On 2 trees overgrowing mosses. Rhizocarpon geographicum. On BVG erratic. Xanthoria parietina. On twigs of trees. Polystichum aculeatum. In grikes, some plants with huge (1m.) fronds. 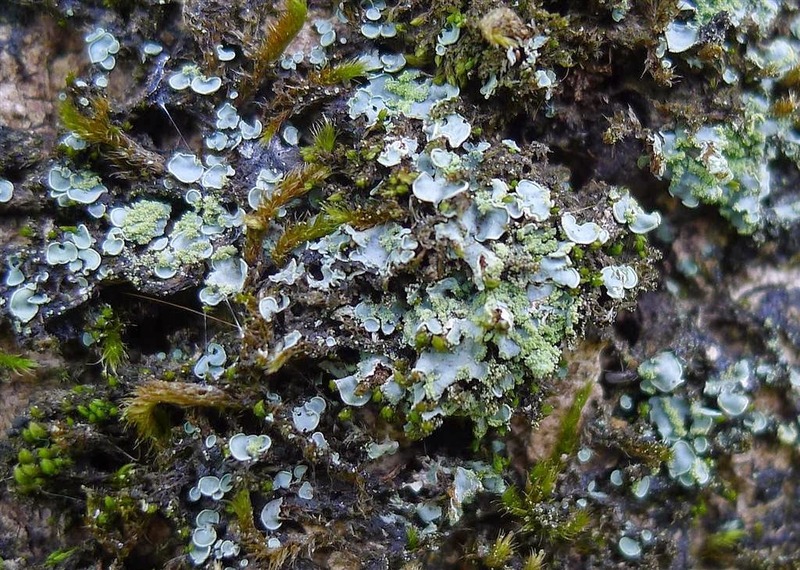 The lichen Normandina pulchella is an old woodland indicator and is an interesting find. It appears to be spreading into urban areas on trees unconnected with old woodland. This list is very incomplete, many more species in all groups would be found if surveyed properly. There are no records here for Lancelot Clark Storth Reserve.